So most of you are asking is this as good as their debut album released back in 1977? Well let me say that it must be measured on different terms and conditions. This may shock many of you out there but I really like this album. "Homo Homini Lupus" could perhaps be best described as somewhere between classic LDF and modern prog acts with a modern flare. If you are like me then their first album is a treasured classic and I would end the discussion there and open a new chapter for LDF. I have read far too many reviews suggesting this new album is inferior that I could puke. In contrast LDF's new album is full of life and loads of symphonic influences and at times I hear the old classic band and album seaping through in drips and drabs. I should mention that most of the original members are back with the exception of lead singer Leonardo Sasso. Vocals are still very well done and hang together with great ease. "Homo Homini Lupus" explores a wide range of themes and ideas from the African bongos to the Mellotron. "HHL" has a very modern prog sound which is full and dynamic and does something for me... I guess that is why opinions are great I hear something in this recording I think many are missing... should be a great debate... but I groove this recording and think it is just grand these lads are back at it. « Le trip est fini, chu loin de chez moi, comme Jim Morrison à Paris, si vous pouvez comprendre... » (The trip is over, I am far away from homme, like Jim Morrison in Paris, if you can understand...) This is what used to say Lucien Francoeur of Aut'Chose (a semi-proggish urban violent poetry-inspired 70s Quebec band). Well, this is how I felt after nearly camping in front of my progressive music store to get that album when it was released. What a disappointment! But what was I really hoping? That a band that was so brillant and released one of my top-ten album of all- time more than 20 years ago would then come back at 45-50 years old in the 90s with an other masterpiece? Let's be honest: this album is not bad. You can put it in your CD player without having the intense desire to bang your head on the wall in pain. You can actually enjoy this music: the sound is good, the arrangements too; one can see there was work done on that album. But guess what? I prefer the sloppy technique and pitiful sound of the "Live" album to this one. PASSION is what is missing. Or maybe creativity. Or both. Those guys went to musical college and they know how to play. They are maestro of their art. But sometimes, the trip is over, you are far from home, and even if you are the best in the world at any art you just don't have anything left to say with your technique. This album is the fruit of a reunion in 1999. Almost all the original members of the band are involved in someway in this project (precisely all but the singer Leonardo Sasso). Nevertheless the result is quite disappointing. The prog vein seem to be gone an this album is just a pop rock one with some good moments, but nothing more. "Lucifer quotidie parat bella usto capillo / Quam ferus qui primus protulit horrendo enses / Nos ad mala nostra corde vertemus micante / Atqui homo fieri potuit homini lupus." The opener title track is sung in Latin, but don't worry. In the booklet you can find all the lyrics with the translation in English. "Lucifer has singed hair and prepares wars every day / How cruel was the one who first invented the ferocious swords / Our throbbing hearts cause our own misfortunes / Yet mankind has chosen to be a wolf against its fellow men.". 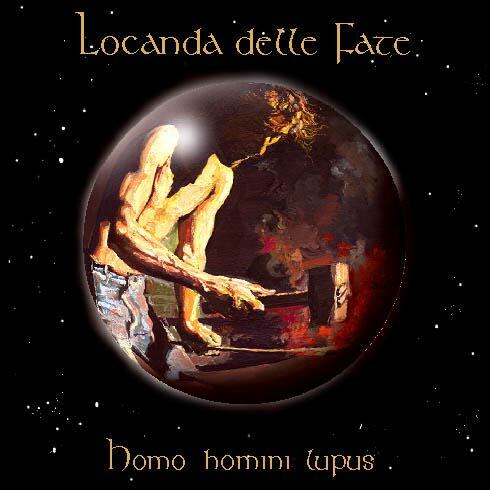 "Homo homini lupus" is a quite interesting song with amazing backing vocals, mellotron, Hammond B3. Anyway the rest of the album is not so good and after the first track the music turns to melodic pop. To save only "Giro tondo" with a nice use of accordion and harmonica and with a happy rhythm, "La fine" with some nice harmony vocals and the final "Fumo" with a nice acoustic guitar part. In the whole nothing special, just an album for collectors and melodic pop lovers. I have known of very few bands that made a come-back after twenty-two years of silence. On top of this, "Locanda..." only released one studio album (but what a great one !). I wouldn't name these few bands (prog or not) who have tried this chalenge but I can't think of a single great result (even not VDDG). So, it is with curiosity that I discovered this album and I have to say that the deception was enourmous. There is nothing left from the grandeur, complexity and wonderful harmonies available on their masterpiece. The musicianship is still great of course, but in terms of compositions there is hardly any good song featured here. Average rock music with an Italian flavour. Nothing to do with "Forse Le Lucciole...". Even some awful songs, would you believe... "Giro Tondo", the short "Bandando" of course, but the palm definitely goes to "Plovi Barko" which sounds as an African tribal song. This is too much for me. It is almost with relief that the listener reaches the next song : "Stanotte Dio Che Cosa Fa". Nothing great, of course. A mix of prog and rock. Just average. 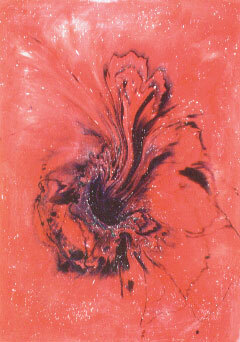 As the syrupous ballad "Certe Cose". Same awful African "choirs" during the pityful "Ojkitawe". What happened ??? The poor funky "Fumo" is not helping this album of course...A poor closing song. My opinion is that this band should never have released this record. They would have remained as a brilliant band even if short-lived (one wonder band, really). Two stars. Do not even approach this. It's hard to find any prog music elements down here with this album. This Italian prog band actually has excellent virtuosity in composing good music. Look at this album. I believe you all agree with me that in terms of melody, almost all song presented here are catchy and they comprise notes with catchy melody. The way the singers sing also indicate how emotive the compositions are. Musically, they also generate good harmonies resulted from each instrument played by the musician. In terms of structural integrity of each song is quite good and solid. But as far as my personal taste the music sounds too boring for me because it's much more pop than prog or rock. So, I get bored very quickly. Yes, I do enjoy the Italian lyrics even though I don't understand. But that is not the only thing if the overall attractiveness is not here. All music sounds too simple here with this album. One thing is excellent for sure is the sonic quality of the record. Overall, I leave it up to you on how you view this album. To me, this sounds like an Italian pop song with very very (or even not at all) prog elements. Keep on proggin' ..! 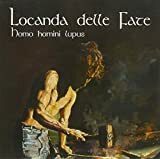 Post a review of LOCANDA DELLE FATE "Homo Homini Lupus"